Now, for the first time, this feels right. Wrapping things up, telling you what happened in 2015, because now I use Patreon and your kind donations to create. It is only fitting for me to tell you what you got for your money’s worth. Actually a lot happened and you can see most of it in the above collage. Then we’ll talk about what’s coming up next, and that’s a handful as well. Submachine 10: the Exit. Yes. The big one. The last one. Well, not the last one per se, but the last one in the main storyline. The Exit will end the story of Murtaugh, Liz, Einstein the cat and all other plot lines that occurred within the series in last 10 years. Jesus. 10 years. Yeah, hard to omit that, not only the story ends, but we also have an anniversary on our hands. It all comes up together nicely, doesn’t it. Yes, and what a resounding yes that is. 2015 was, in fact, the year of the Submachine, but not because of the year-long celebrations, but almost a year-long work on this game. I’ll be honest, when I started working on it back in April, I had a simple idea of what I want to do, a foundation of sorts. Watch out, minor spoilers ahead: The first thing I designed was the 8-way teleporter. When I counted all possible combinations of a 3 boolean-button system, and it turned out to be 8 – it seemed like a perfect match for this game. 8 layers, 8 teleporters. At that early stage I thought that the game will sport the same teleporter as in Submachine 4 for example, you’ll just jump between layers. But then I had a better idea. Each layer should have it’s own teleporter, not only unique in structure, but also representative of the whole layer as well. I basically built all different layers around different teleporters. 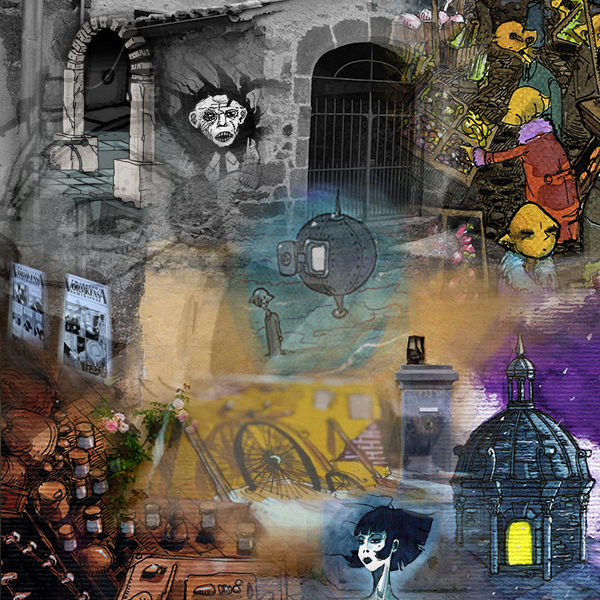 The second design idea was to revisit locations from previous games, each layer would take you to a different revisited location. That was the basic idea for this game, and I would be able to finish it around September for the actual 10-year anniversary, but then the game grew… and grew… and grew… Every single new idea I had was put into this game. I rejected nothing. And here we are. Game was released on December 21st 2015 and the rest is history. I could talk about this game more, but maybe here’s not the place for it. You can find this game here. Rewolucje 9: under the Snow. Yep. Maybe not all of you know it, but comic books are as important to me as games. Actually this one will be created first, starting tomorrow. The sooner I finish this, the sooner I’ll have rest of the year dedicated solely to the last Submachine. And that’s exactly what happened. I finished working on that album in March and from that point on it was nothing but Submachine. It was released in May, and you can read more about this comic book here. Submachine Universe HD. This will come handy as a special feature bonus material once I create Submachine bundle. It will probably be sold separately as well, I’m not about to screw over all of you that already bought games from me and would prefer to not invest in a bundle that consists in 90% of games that you already own. Yes, I did do that. You haven’t seen it yet, true, but it’s there. Done and ready to be delivered. The idea was to add that to the Submachine Bundle, but meanwhile Patreon happened, and thanks to that fact, the Submachine Universe HD will be expanded even more. Not sure when, but it will be. And then it’ll be released to the public. That being said, I’m not sure why this project was put on top of my Plan B. It was proably because of the 2014’s hd-fication frenzy and I just wanted to finish it with a bang. You know, so that the completionist in me is satisfied. Moving on. 10 Gnomes in… Who knows where. And for that matter – who knows if it will be created at all. Just saying, and leaving a placeholder for my future self. Yes, of course. And that’s a lot of bull crap on my part as well, because when writing those words I knew exactly that this game will happen and even where those gnomes would take place. I already had the pictures from the location. 10 Gnomes in Montaigut-le-Blanc were shot in summer of 2014. Moreover, I already have pictures for the next gnomes game, and in the spirit of transparency I’m telling you this info right now. That’s what Patreon does to a person. Read on to find out where are we going to search for gnomes in 2016. As you probably know by now, I’m a completionist. It physically hurts me to leave an unfinished project. And there are only TWO games left in the Mission to… series. Therefore, coming up in 2015 – two small games, Mission to the Sun, and – last in the series – Mission to Earth. I need to put this series to rest. I just have to do it. Yeah, sure, what a completionist I am. Here’s the only place in my entire plan where I have to write: LOL NOPE. However, since they were in plan B, I’m not so surprised they were bumped a year ahead, again. But there’s a reason for it. It’s name is, yeah, you guessed it: Submachine 10. This behemoth of a game took everything from me and then some. I was barely able to finish 10 gnomes and Where is 2016?. But there is also ANOTHER reason why I haven’t touched those mission to… games this year. I’ll explain in detail below, and then in another, separate article. Yeah, patreon-induced transparency, remember? That’s in full effect. Where is 2016? Well, like, naturally. Until I specifically say otherwise, there’s always another Where is…? game coming up. Yes, naturally. Barely made it, but Where is 2016? happened right after the premiere of Submachine 10. But I’ll be honest with you. This year, as never before, this game felt rushed and forced. I didn’t enjoy creating it as I usually do. For example, a year before, Where is 2015? was as fun as it gets. It took entire year to create with all different locations from each month. And it was good. This year? Not so much. I have to shake this series up, think of a new way to end the year, because if I won’t – I’ll have to ditch the series entirely. Next year – no more point and click hidden object stuff, I’ll return with some small skill game, as before, because this series sports many different styles of gameplay. I’ll probably go with a small platformer game, like in 2010 or 2012. I just have to stop doing the same old thing and expect different results. That’s the definition of insanity, as Vaas taught me. About that insanity – more coming up below. Daymare Mini Bundle. There are four DMT small games that just can’t be sold separately. I can’t justify charging a buck for any of them on their own. Thus – creating a bundle of those four and selling it for mere two bucks – that’s the way to go. Those games are already in HD, I updated them somewhere along the way in 2014. You’re wondering what those games might be? Well, there’s Daymare Kite, Daymare Invaders, Daymare Cat and last but not least – Where is 2010?. So there, that’s a plan. Daymare Bundle. Kind of self explanatory. A bundle containing all games from the series wrapped up in one zip file for your convenience. Yeah, self explanatory. That was done as well. Now you can own entire Daymare Complete Collection with just one click. Or two, or… wait, I never actually checked how many clicks it takes to buy one product from me. Whatever that number is – you can get all Daymare games at once. There. Explained the self explanatory item. Like a pro. Submachine Bundle. Well, after all is set and done and the dust settles, this bundle will contain everything there is to own in this series, including all main storyline games, all side games, Submachine Universe offline and all soundtracks. The dust didn’t have the time to settle and this Submachine Complete Collection was already released. Like, a day after premiere of Submachine 10. It does not contain Submachine Universe, but I explained that in detail above. 24-hour comic challenge – I’ll probably go and participate in this one, since I’m on a biennale pattern when it comes to testing your limits with this insane idea. Yeah, back to insanity. That happened as well, I was able to create a 4-page Rewolucje comic set for print in Znakomiks Magazine. More on the subject here. A tribute to Postapo series by Daniel Gizicki and Krzysztof Małecki. It was published in a special tribute anthology. Przesilenie (hump) a short story published in Zeszyty Komiksowe #20.
two festival-related xerographic zines from my old series “VormkfasA“. This one and this one. Each sports two one-page comics from me as well as works from my friends from polish comic book scene. It’s kind of an artistic happening than a real publication, each issue has only 50 xero copies, and I give them away free during comic cons to people who bothered to see me for an autograph or participate in a meeting with me. Also – my friends get a copy. It’s a low-profile event and I shouldn’t even be talking about this here. Like fight club. small tribute to Valentina by Crepax. A lot of Patreon rewards, hand drawn and painted. first episode of Daymare Morphs, also Patreon related content. Aaaand that’s it, I believe. Ok, now the tough part. The 2016 plan of things to come. Here we go. As you can see, that 2016 sheet of paper is beautifully blank. Not for long, mind you, but we’re just opening that 2016 page, and it will fill soon enough. Ok, again with those plans. 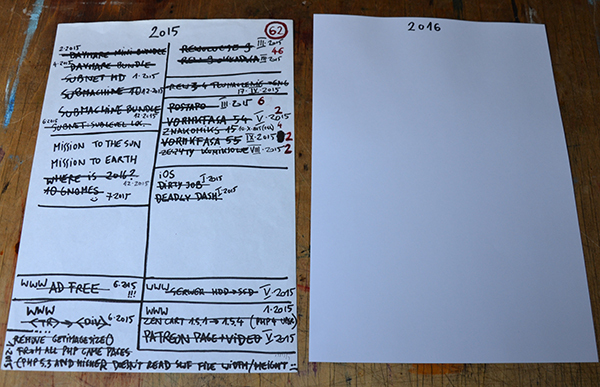 You know what, this year I’ll divide it to two plans, plan A being about comic books and plan B – about games. That will clear things up (not really). But Plan B is something that will require another, completely separate article from me to clarify in full extent. Hang on, that OTHER article is coming up as well in few short days. So, let’s get back to plan A.
Revolutions 10: Full Automatisation. Yeah, 10th book in the Revolutions series, written by Jerzy Szyłak, slated once again for May release, which means I’ll spend most of Jan-March painting that book. Fortunately the story is already written (it has been since… uhm… 2004… 12 years ago?… Jesus…), so all I have to do is draw it. Seems legit. Revolutions 1: the Parabole [digital version] – first of the Patreon sponsored projects, this will require me to prepare entire album for an e-book version, which then will be sold in .pdf, .cbr and .cbz formats (supporters from Patreon get that book naturally free). Check it out here. Revolutions 2: the Elipse [digital version]. Same as above. I want to publish those two first books from the series this year, and if it turns out that you like it, I’ll press on with the rest of the series, 9 albums so far, 10th being in production right now as I said a minute ago). More about this album here. Daymare Morphs [online webcomic version]. Again, thanks to Patreon you can enjoy this comic in a webform for free. It’s out already. You can find it here. The idea is – releasing one episode each monday this year. All of those stories are already done, it’s just a matter of digitalisation and translation. I feel it’s achievable. Maybe except summer months when I’ll be away from home, but other than that, you can check every monday for a new episode. Ok, now things get a bit shaky. We’re now talking about games, and frankly speaking I don’t have much to say about this subject right now. I will expand on this matter in that OTHER article I was talking about before. This just needs so much more explanation. And it’s coming our way. The most important thing you need to know right now is that things are going to be even more awesome than Submachine 10 or anything I’ve created in the past. I’m at that point where I want to evolve again into something bigger and better. But – just for the sake of argument, let’s list some things here, so I can face them in January 2017. Mission to the Sun and Mission to Earth. Yeah. You can stop laughing already. I know those two games are like never ending inside joke by now. They’re always on this list, but they never get made. This year will be different. This year they will both get made. You just wait and see. Probable release date – somewhat around summer 2016. 10 Gnomes in Pothia. Ah-ha! I told you I already had location pictures for this one! Yes, this game is definitely happening. Where is 2017? well, as I said before, if I find a new way to entertain you next December, I’ll do it. If not, this series is done for. Let’s hope for the best here, ok? Covert Front 5. This one is a bit shaky. It’s like 40% probable. I won’t be surprised if next year’s wrap up will encounter a LOL NOPE on this one. Can’t tell you details right now, but there are a lot of circumstances that might influence this game’s existence. One being – game storyteller, I have no idea whether he’ll come up with a decent story for CF5. Other variables include – me being able to create this game at all. Wait, I already said too much right now. The foundations of something bigger and better, a proper game if you will. I know this one sounds vague, but believe me, it’ll all come together once I explain in detail what I’m about to do game-wise this year. Just hold on. And that’s it. I know it looks like I’m laying low concerning games in 2016, but I assure you I’m not. I’ll be working harder than ever. Harder than for the last 10 years, that’s for sure. Things are looking good, now all I have to do is write that OTHER article I was talking about here. Stay tuned. You’ll learn soon enough what’s up and why it’s a good idea to support me on Patreon.